Mount these valves between two standard ANSI/ASME pipe flanges for easy installation and maintenance. They secure with bolts instead of threading in so they tighten with less torque and can be quickly connected and removed. 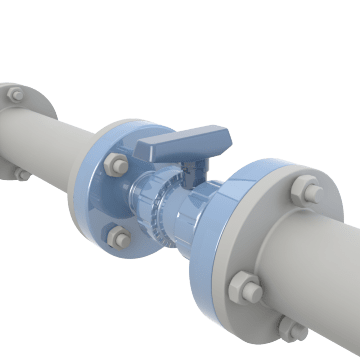 Their plastic construction means they won't rust and are less prone to buildup, so they maintain better flow over time compared to metal valves. Turn the valve lever to rotate the ball to start or stop flow.